My Raspberry Pi camera module didn’t arrive until this week (the first production run sold out almost immediately back in May) and, unfortunately for the plan, Microsoft have turned off the ability to register a Skype developer account in the meantime :-(. Using the Skype infrastructure with the Skypekit “headless” client would have taken advantage of all of Skype’s well-established security and routing capabilities, and the remote end could have been any device with a Skype client, but for whatever reason it seems Microsoft have decided that they don’t want people to do that. There is a Linux security camera package called “motion”, which incorporates webcam functionality; Pi user dozencrows has adapted this to work with the MMAL interface that the Pi camera offers. Unfortunately this turned out to be too heavyweight for my purposes, using most of the CPU and giving only a low frame rate. do nc.traditional -l -p 1234 -c "exec raspivid -t 600000 -n -w 640 -h 360 -o -"
We are using nc.traditional, not the plain nc, because we need the “dangerous” -c option which has been taken out of the newer versions for security reasons; it’s OK, I know what I’m doing, I’m a security professional :-). The URL is constructed with the protocol tcp, the IP address of the Pi (you can find this out using ifconfig), and the port number 1234 that we chose in the netcat script above. There is still plenty of scope for improvement in usability, and there is no access control, but the basic functionality is working and I’m pleased to do it entirely with open source components! This entry was posted on 16 July 2013 at 5:58 pm	and is filed under Open Source, Risks. Tagged: Raspberry Pi, video streaming. You can follow any responses to this entry through the RSS 2.0 feed. You can leave a response, or trackback from your own site. I like the way you have routed the camera out of your case to help keep the camera pointed a certain way. I also love the lego case you have posted in your follow up article. Have you posted any details on how to build that case? It appears to have a movable cover over the camera. Glad you like it! We’ve been through several iterations on the Lego case, and it’s nearly there but not quite. The main case is good and sturdy, and adaptable to leave a gap for the camera cable or not. The camera module is attached with Lego hinges so it can be pointed wherever you want, but the current construction of it isn’t very robust, so I’m going to try some different-shaped pieces with it. 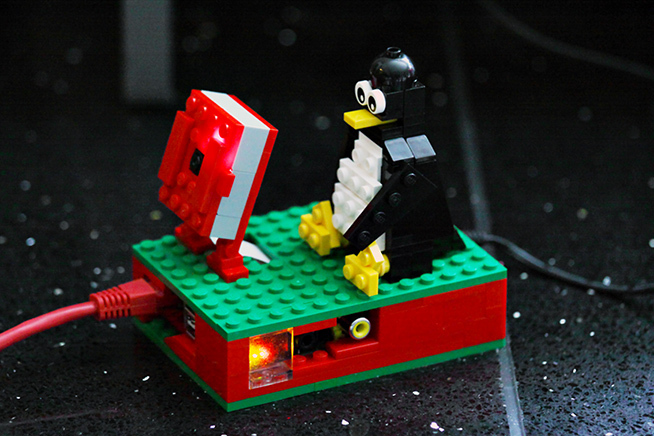 I plan to blog about it once I’m happy with it, and we’re considering offering it as a kit on eBay (the Lego Tux penguin too if you like it :-)) and/or as a prize at Over the Air next month. Hello Liam! Unfortunately the short answer is no, I don’t know of a way to combine audio and video streams. At first I had hopes of using Skype, the Pi camera and a USB microphone but Microsoft killed Skype for Linux on ARM, and a USB microphone takes up so much of the CPU there isn’t enough left to handle the encoding and multiplexing. I was playing with Koalo’s I2S audio driver and a PCM1803 breakout board but wasn’t able to get it to work; this may well be easier now the driver is included in the standard kernel and there is an official audio card available. Incidentally, we have used the ssh and vlc video streaming solution successfully using a 3G dongle on the Pi, so at least that part should be plain sailing 🙂 Good luck! P.S. Do please let us know if you find a working solution, it would be great to be able to use the Pi to record and/or stream live presentations!